I’ve started a new lifestyle: following the Trim Healthy Mama eating plan. Over the past 4 months, I’ve lost allllmooooost 20 pounds. I’m so close! Then there are 15 more to lose after that. I can do it! One thing I love about the plan is that I can still eat real food! I don’t have to buy special meals (though there are some special ingredients here and there for certain recipes) and I’m not limited to only a handful of ingredients. The main thing is being sure what I eat comes from one primary fuel source, either fats (S for “satisfying”) or carbs (E for “energizing”). 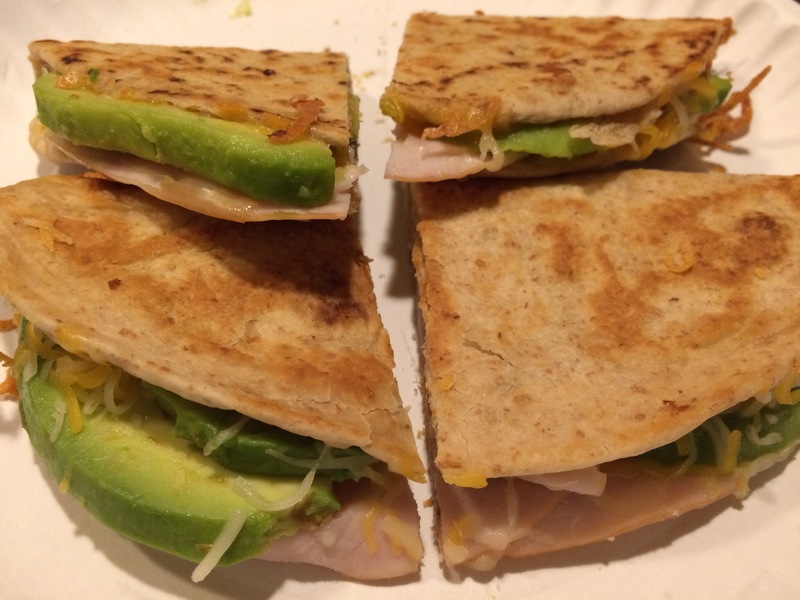 These quesadillas are an S meal because of the fats in the butter, the cheese, and the avocado. The two whole wheat low carb tortilla add a total of 6 net carbs, so I’m in “safe” territory. They’re quick and easy, and they’re delicious! They got 4/4 thumbs up here, but it was agreed that we need to add bacon next time. Heat skillet over medium heat. Butter one side of tortilla and place butter side down in hot skillet. On one half of the tortilla, layer cheese, turkey, avocado, bacon, and additional cheese. Fold empty half of tortilla over the filled side, then flip over. Grill on each side until golden brown.